If there's one character trait I want our kids to develop from growing up on a farm, it's a deep love and respect for all animals. I don't know how to teach kids to love animals. I think loving animals comes from living with animals and caring for them. Dan and Monika spend countless hours outside with our animals and, as the pictures below show, I think they're well on their way to becoming animal lovers. Dan and his favorite cow, Love. He insisted that I take their picture together one night in the barn. 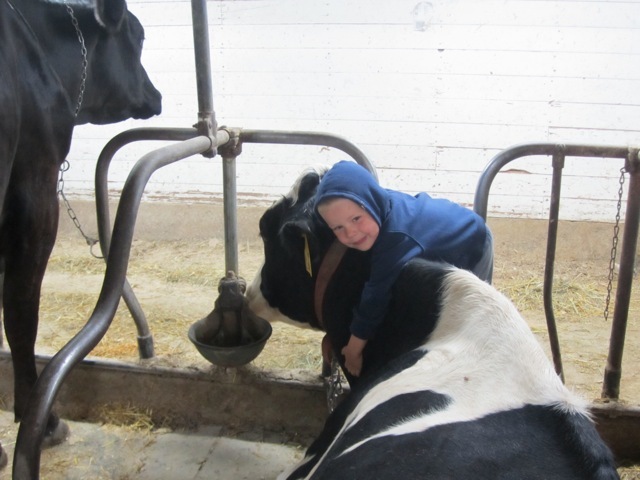 Love is the cow Dan always wants to milk and the first one he identifies out in the pasture. I think her red neck strap helps Dan pick her out. She is as docile as her name implies. 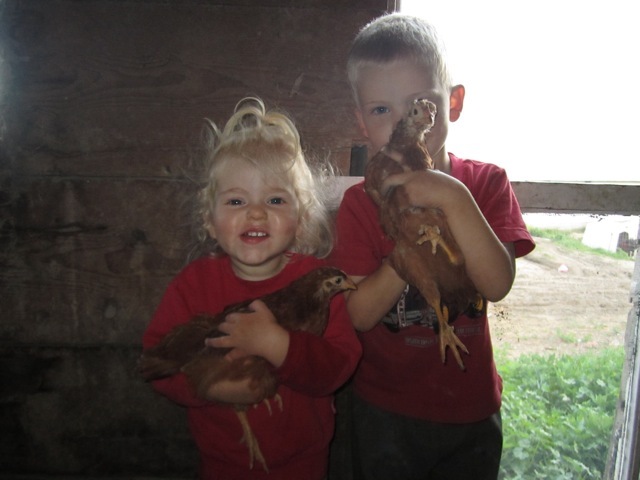 Dan and Monika with two of the pullets we raised from chicks this spring. They absolutely loved watching the chicks while they lived in the stock tank. After we moved them to the chicken coop, Dan and Monika were always in there playing with them — Dan trying to catch them and Monika sitting in her little blue chair like the Poultry Barn Superintendent. Dan and his favorite kitten, who doesn't have a name other than 'Dan's Kitty'. 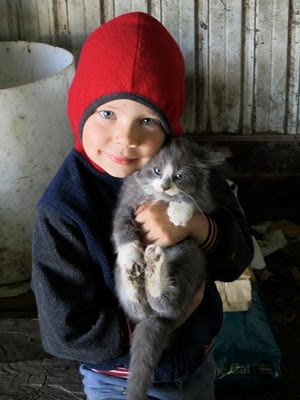 Dan was the first one to find this kitten after it wandered out of the nest one day. It's been his ever since. 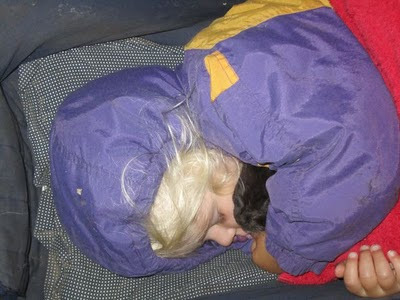 Monika napping in the stroller with her favorite kitten, Black Kitty, who napped with her for quite a while before she wiggled her way out of Monika's arms.